What is the function of the adrenal glands? What can go wrong with your adrenal glands? How is adrenal disease usually treated? The function of the adrenal glands is performed by a wide variety of hormones released by these structures and is mostly directed at the physiological response to stress. The medulla is responsible for producing epinephrine and norepinephrine (adrenaline), which control the body’s reaction to stress and affect blood pressure, heart rate and sweating. The adrenal cortex produces hormones such as cortisone and aldosterone which are necessary for fluid and electrolyte (salt) balance in the body as well as regulating the use of dietary protein, fats and carbohydrates and controlling inflammation. Cushing's syndrome may also result when steroid drugs (such as hydrocortisone, prednisone or dexamethasone) are taken over a prolonged period or at high doses. These steroid hormones are often used to treat inflammatory illnesses such as asthma, rheumatoid arthritis and inflammatory bowel diseases. Additionally, long-term treatment with these medications can inhibit normal pituitary function (which usually controls the adrenals) and cause secondary adrenal insufficiency. Adrenal insufficiency or Adrenal fatigue is a common problem characterized by a deficiency of the hormones produced by the adrenal glands. Adrenal insufficiency is sometimes also linked to chronic fatigue and thyroid problems. Adrenal disease is most commonly diagnosed based on laboratory tests which measure the levels of adrenal hormones (specifically cortisol) in the blood. The specific type of treatment usually prescribed for adrenal disease will be based on the underlying cause. Treatment generally takes the form of synthetic hormones which increase the low levels in the body or hormone inhibiting drugs- depending on the disease. Treatment is usually lifelong unless the cause of the disease is removed such as a tumor which is surgically removed or treated with radiation or chemotherapy. As adrenal damage and adrenal fatigue are so often caused by a stressful and unhealthy lifestyle, it is logical that this situation can be best treated and improved with a holistic and natural approach. One’s overall health as well as the well-being and optimum functioning of the adrenal glands should be addressed. Certain herbal ingredients are well-known for their tonic effect on the adrenal glands and improving ability to cope with stress. Relaxation methods and reducing stress in ones daily life, as well as eating a healthy, balanced diet and exercising regularly can all be of great benefit to adrenal disease. Used regularly, AdrenoBoost can improve adrenal functioning and help you to cope with stress, while improving energy levels and resistance to illness. Like all Feelgood Health products, AdrenoBoost contains no animal products, gluten, artificial flavours, colours or preservatives. 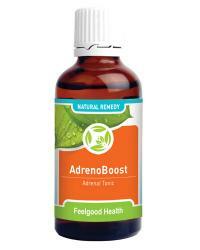 AdrenoBoost comes in a convenient tincture form and is available in 50 ml bottles. Simply dilute drops in a little water or juice. AdrenoBoost is highly recommended along with Detox Drops. Results may vary, due to a number of influential factors. Over time (usually 3-6 weeks) AdrenoBoost will act in a supportive capacity to healthy adrenal glands and support a healthy endocrine system, with cortisol levels of some individuals responding sooner than others. Best results are achieved when AdrenoBoost is used consistently. Employ stress-coping and relaxation techniques and try to reduce the amount of stress in your daily life. Eat a healthy, balanced diet with a focus on fresh, whole foods and don’t skip meals. Avoid stimulants like caffeine, as well as nicotine and alcohol. Five years ago I was diagnosed with Addison’s disease and it was almost a relief to find out that there was something very real wrong with my body. I was put on corticosteroid drugs which helped, but every time I had something stressful happen in my life or I got the flu I felt like I was back to square one and the doctor had to increase my dose. I didn’t want to be so dependant on these drugs and started to look into alternative treatment. I found your product on the internet and showed the information to my doctor- he was cynical but said I could try it as long as it was under his monitoring. After a few months on AdrenoBoost we had to drastically reduce my steroid medications and I felt better than I had in a long time. My doctor was impressed and so am I! Thank you so much for providing a safe and effective alternative, I am going to tell everyone I know about your natural remedies. I am going to stock up on your AdrenoBoost remedy- I don’t quite know how I survived without it. After feeling run-down and generally not myself for almost a year, my doctor suggested I might have Adrenal Fatigue. Having always been one to avoid prescription drugs, I started researching natural products to help my condition. I came across your site and ordered the AdrenoBoost- am I glad I did! I haven’t had such energy and stamina since my 20’s! I have been using your AdrenoBoost for a few months now and although I was skeptical that it would help, I was desperate! I have worked in a highly-pressurized, corporate environment for more than a decade and, being a woman, always felt the extra pressure to prove myself as well! All this stress started to catch up with me in a big way and I began to see my health deteriorate dramatically. My hair was falling out, I lost too much weight and I was always tired no matter how early I got to bed. After a few weeks of using AdrenoBoost and trying to eat more healthily I started to notice a difference: less hair in the shower, I stopped getting every cold that was going around the office and, for the first time in years, I woke up feeling refreshed in the morning. I had forgotten what that felt like! Thank you for an amazing product- it has helped me to regain control.